The biggest ever Scottish GUKPT Main Event has been added to the ever growing archive of GUKPT history books. Grosvenor Casinos welcomed 258 entries to the GUKPT Main Event, surpassing the £100,000 guarantee and generating a prize pool of £129,000. The team at Grosvenor Casino Maybury thoroughly enjoyed hosting a week of bustling poker action and would like to take the opportunity to thank all of its loyal customers for supporting the tour. 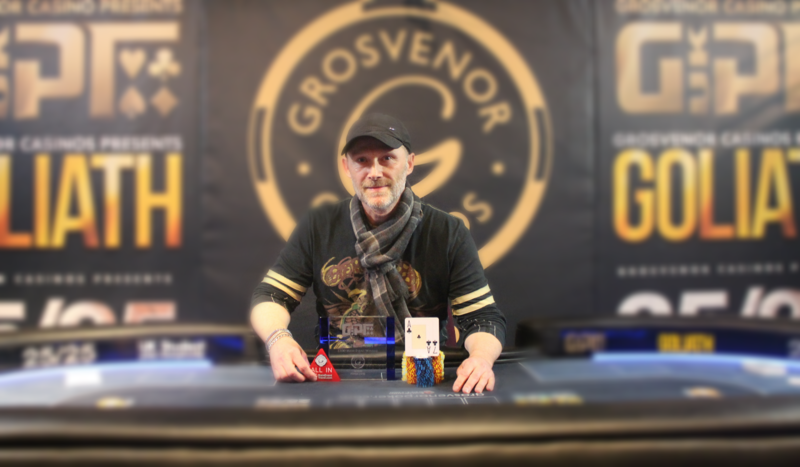 There can only be one winner and this year’s GUKPT trophy ended up in the deserving hands of Garry Stevens-Smith. The financial trader from Warrington has been playing poker for just three years and according to his resume, his skill for the game is clearly flourishing. This result beats Garry’s previous best cash of £1,400, which he won for coming 3rd in the 2017 Christmas Cracker at his local Grosvenor Casino in Manchester. Garry is now the latest person to join the illustrious GUKPT winners’ club and is already looking forward to using his £36,000 bankroll to further his poker career. True to the nature of many a GUKPT final table, GUKPT Edinburgh showcased the diversity of players that the GUKPT attracts. Two Scots, one Irishman and six Englishmen made up the final nine. The line up included a 74 year old retiree, a 29 year old soon to be father, a Managing Director, a Gas Engineer and a full time “Gambler” amongst others. Some players had been playing poker for just three years whilst others for much longer. Two of the finalists had won their entry via a satellite tournament making their winnings even more significant. Grosvenor Casinos’ poker team will now focus on their next events which include the London 25/25 taking place at The Poker Room from the 2nd to 6th May. The next GUKPT will be heading to Reading’s Grosvenor Casino Reading South for another installment of the £100,000 GUKPT Main Event in June. Then of course the event the whole poker world is waiting for – the record breaking Goliath which will be held at Grosvenor Casino Coventry from 26th July to 5th August. This year Grosvenor Casinos has revealed the Goliath Main Event first prize is guaranteed at a staggering £100,000 – an incredible amount of money for a £100+25 buy-in tournament!